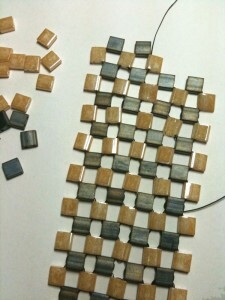 I came across some great pieces using Farfalle Beads! BERNADETT VARGA’s blog AGABEN, showcases the designers beautiful work. 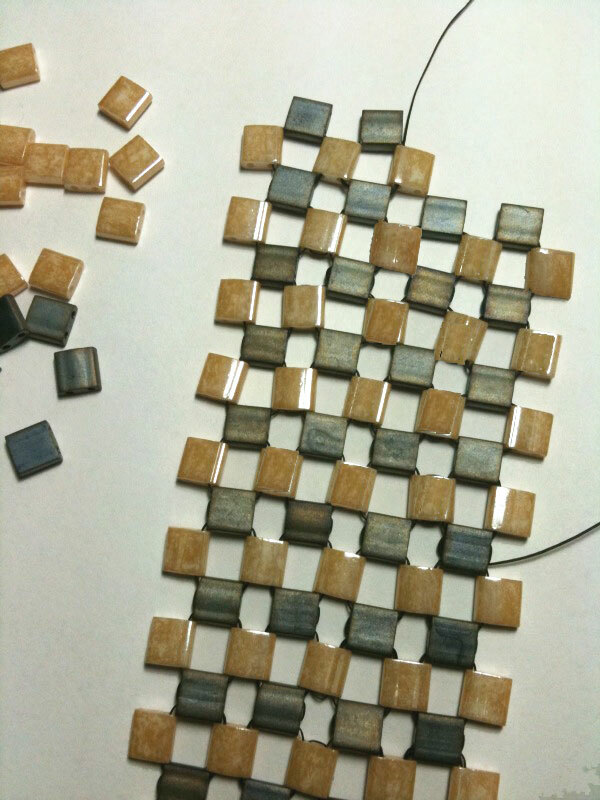 The farfalle bead , also known as Bow beads or peanut beads by some, have an interesting shape that allows the beads to fit into one anothers curves. This interesting shape gives way for endless amount of possibilities. Whether strung in a simple row or sewn in an elaborate stitch there’s no wrong way to farfalle. 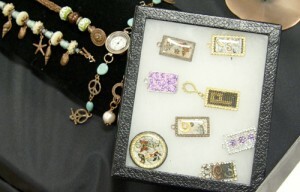 Bernadett Varga’s pieces look elegant and finely crafted. 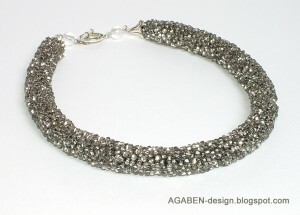 The necklace below looks like such a solid construction using the crochet technique. The round earring balls make me think of how many possibilities you can come up with using the farfalles. 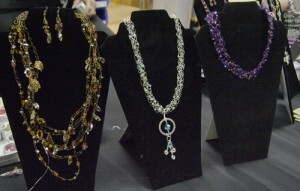 Bernadett uses crochet techniques to create the jewellery and each piece is more interesting then the next. Want to make it ? 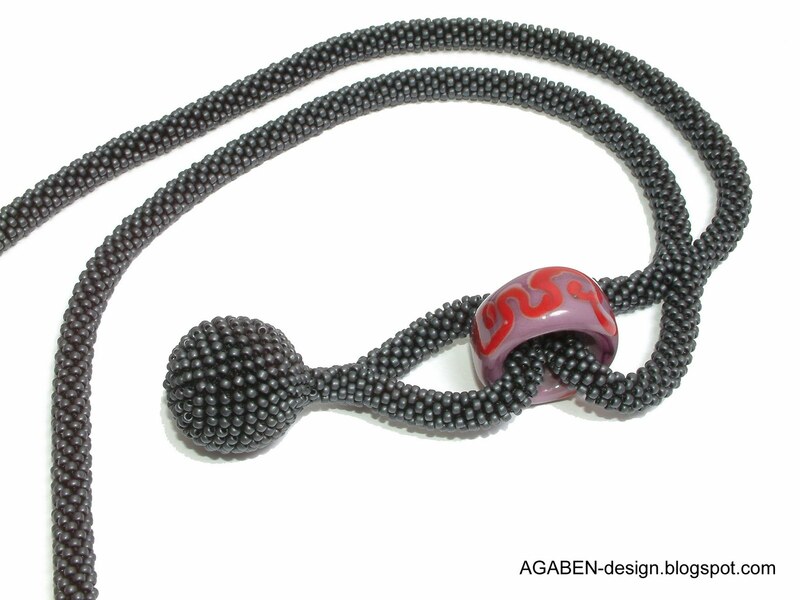 She also has many seed bead variations creating balls and long necklaces with interesting shapes. 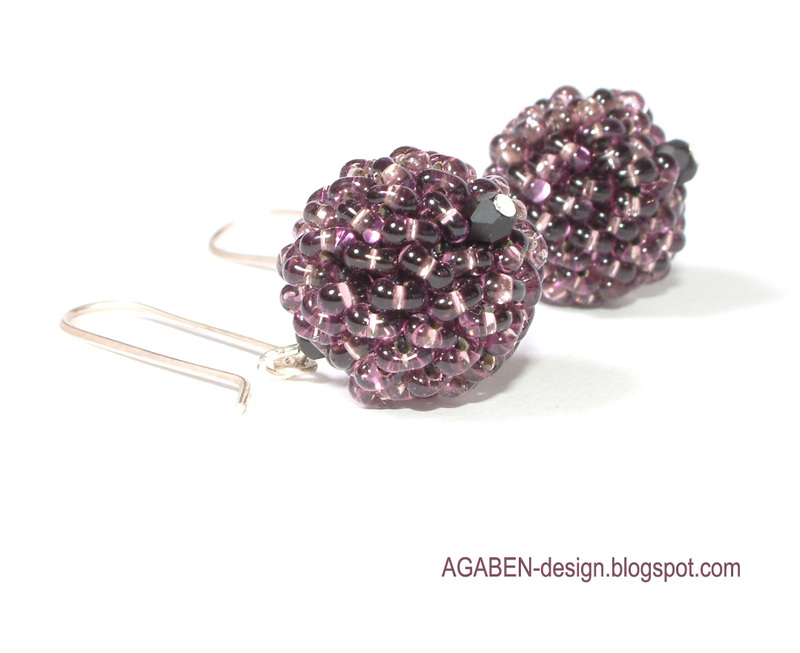 I love her combination of colors and the way she combines glass beads with seed beads and crystal bead accents. 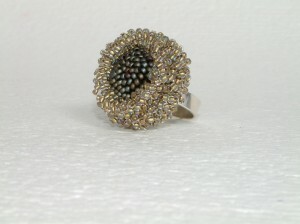 The matte seed bead combination and transparent seed bead is great on this ring. The seed bead creation is nicely mounted on a base metal ring. Such an elegant yet showy look. We also have sample necklaces in our showroom made by a designer from the Czech Republic; Adella Kodonova. 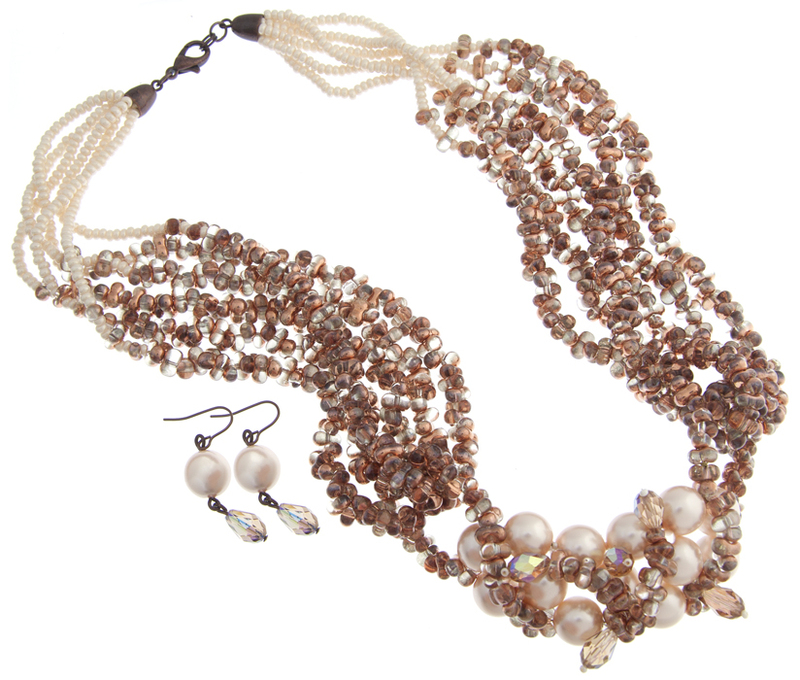 The jewellery combines farfalles, crystals, pearls and seed beads. These pieces have more movement and you can see the shape of the farfalles a little more. The necklace is full of sparkle and glitz. The focal point with the pearls is beautifully done with crystals bursting out. I love the weight of the farfalles and the pearls, it’s a true statement piece. I love this look because really you can combine any type of bead in any variation of color and twist them around. You can make it as chunky or minimal as you like! All you need is a little black dress and this necklace! John Bead’s Bead Extravaganza 2010. 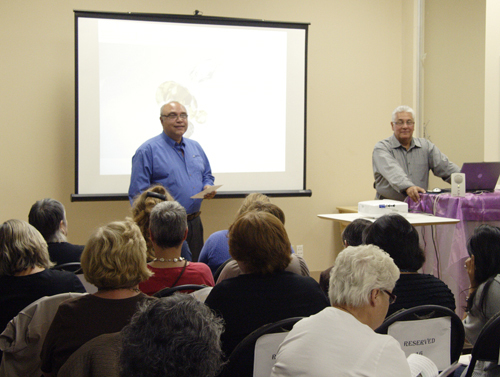 Held September 14th and 15th was a hit ! 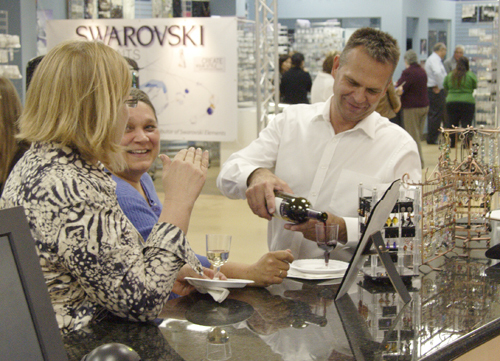 The Tuesday evening wine and cheese, Swarovski seminars, designers, vendors from the USA, and attended by over 200 customers to the john bead showroom, with a number of out of town guests staying for both days. 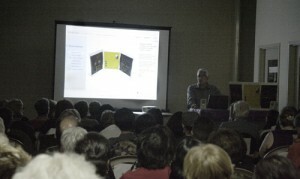 With seminars, demos and make and take workshops from major suppliers from the USA and well known designers. Media personality Leslie Rogalski from Philadelphia, an artist, teacher with a passion for creating jewelry. 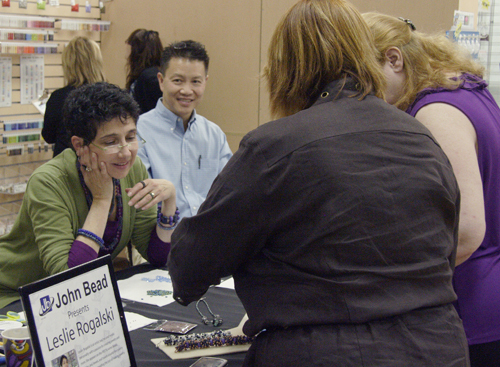 She appears on the PBS TV series Beads, Baubles, and Jewels, With program segments sponsored by John Bead. Leslie is the former editor of Step by Step Beads and BeadingDaily.com, her designs and articles have been widely published. 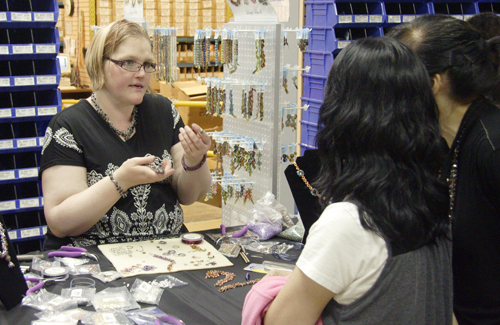 Leslie showcased our Miyuki Delica beads and the New Tila beads. Showing guests the Peyote stitch and the right angle weave stitch with the Tila beads. 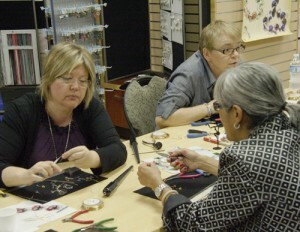 Stephanie Dixon, Canada’s own Swarovski Ambassador was here crocheting up a storm. Her specialty being using 26 gauge artistic wire and Swarovski Elements, Stephanie showed guest how easy it is to crochet and use artistic wire to create rings, earrings and necklaces. Pam Arion from Tierra Cast was here to show an exciting sneak preview into their new Alternative line; Tierra Cast: Quality in the Making . The line features TWO NEW Finishes ; Black , a classy and edgy shade and brass oxide that serves as a perfect complement for vintage-inspired designs. These finishes are shown in many of Tierra Casts already popular clasps, charms, caps, beads, bails and spacer designs. John Bead is excited to have these in stock. Pam also showed how great Tierra Cast can be combined with other beads and Swarovski Elements like the Tierra cast Setting that fit 12mm Rivoli stones. As well as the Glue-in Charms that can hold ss10 flatback stones. 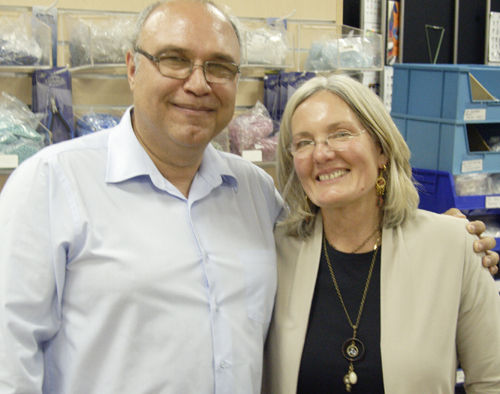 Douglas Ho, President of Unicorne Glass Beads was also in the showroom. 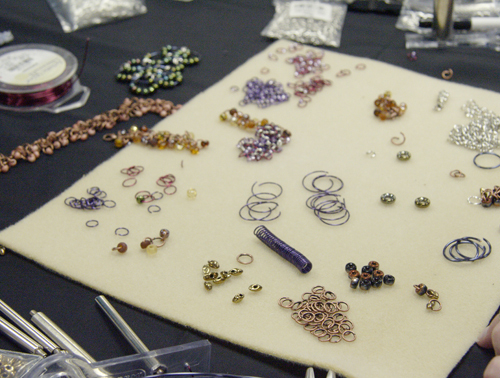 Designers from Flirt were doing make and take earrings using Unicorne beads. 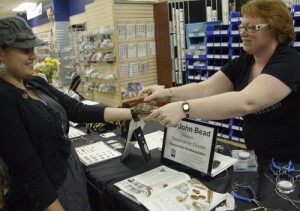 They showed guests how to make their own hooks using artistic wire and used tools from the JOHN BEAD line; (JB PRO PLIER CHAIN NOSE WITH 3 STEP NYLON V ). Guests then added 3 teardrop beads to the hooks and perfect, a new pair or earrings. Tuesday nights wine and cheese cocktail party was full of excitement and buzz, one couldn’t help but feel like in a tradeshow. Swarovski’s North American representative; Vince Scalera debuted Swarovski Element’s New colors for the autumn/winter 2011/2012 season as well as new shapes, finishes and production components. 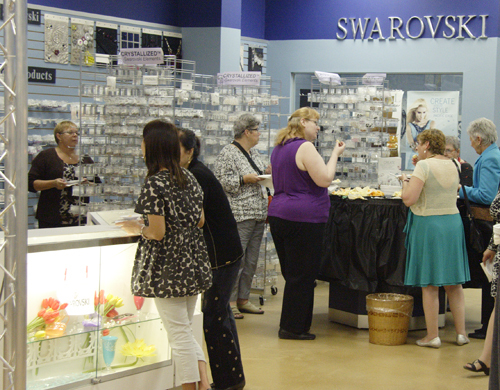 (Book your appointment today with one of our sales representatives to learn more about what’s new from Swarovski Elements). Vince also presented next seasons major fashion inspirations, themes and moods. Guest went home with gift bags complete with Swarovski’s new magazine SALT as well as samples of the featured seasons products. 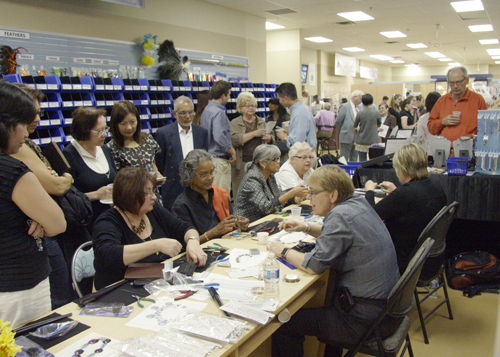 We would like to thank the Toronto Bead Society and the Canadian Beading Magazine for supporting us and inspiring our guests. 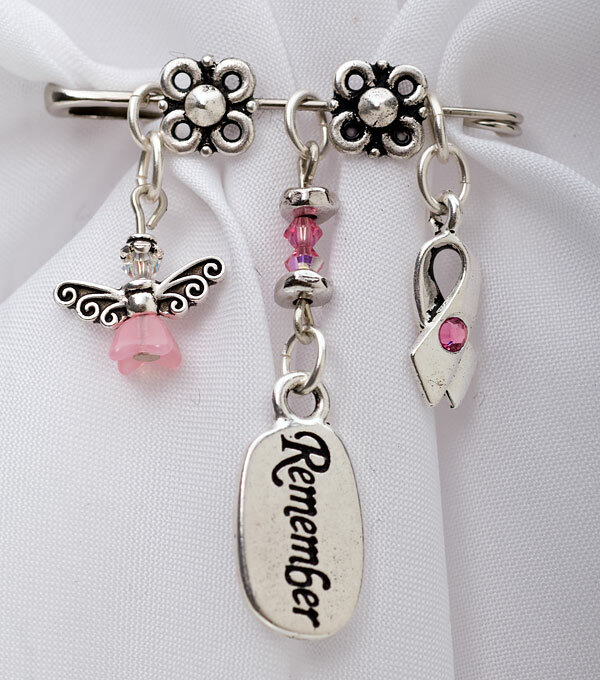 Author adminPosted on October 4, 2010 October 6, 2010 Categories EventsLeave a comment on Bead Extravaganza ! 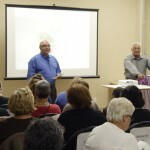 Welcome to John Beads New Blog ! Presenting John Bead’s newest media outlet. We are very excited to present this blog in which we will showcase our past and upcoming events. 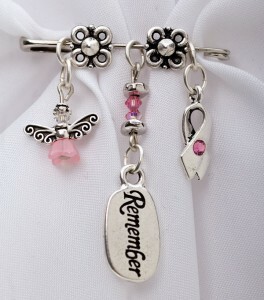 Also a place to feature new items and really anything and everything to do with beads. Stay tuned for some wonderful blogs from various John Bead members and stay in loop with what’s new !! Author adminPosted on October 4, 2010 May 3, 2016 Categories News1 Comment on Welcome to John Beads New Blog !